A high-quality preschool,kindergarten, and first grade education, particularly in reading, is crucial to building the foundation for a student’s academic career. Children who fail to develop basic literacy skills by the time they enter school are three to four times more likely to drop out of school in later years. 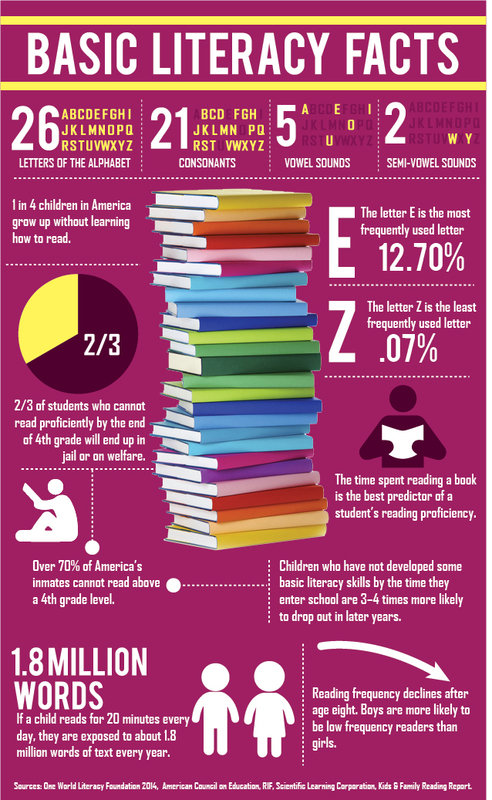 Furthermore, children who are read to at least 20 minutes a day are exposed to 1.2 million words of text every year. These facts are what motivates Quackenworth to provide high quality apps that prepare young children for preschool and beyond. In this post we discuss: 1) the basics of reading and literacy and 2) how to use our suite of literacy readiness educational apps. The focus of these educational apps is on long and short vowel sounds, rhyming, sight words, beginning/ending consonants; all important building blocks to learning how to read. We believe our apps strongly support teachers who want to provide prove supplemental reading materials and parents who want to supply a literacy-rich home environment. We also are of the opinion that there are important milestones that should be met in preschool,kindergarten, and first grade. These milestones include hearing more than million words per year, introduction to stories, the alphabet, vowel sounds, blends,sight words, and more.But before I proceed with a discussion about our educational apps, I would like to discuss some basics facts about reading and literacy fundamentals. 1) Phonemic awareness — the knowledge and manipulation of sounds in spoken words. 2) Phonics — the relationship between written and spoken letters and sounds. 3) Reading fluency, including oral reading skills — the ability to read with accuracy, and with appropriate rate, expression, and phrasing. 4) Vocabulary development—the knowledge of words, their definitions, and context. 5) Reading comprehension strategies—the understanding of meaning in text. In addition to these five important components, schools should also include diagnostic reading assessments, ongoing professional development for teachers, a plan for building students’ motivation to read, and a strategy for integrating technology that assist student’s in learning to read. Integrating these five components and addition strategies will help child in early grades to become strong and confident readers . Although the study was done on a small scale, it provides strong evidence that reading to children has positive biological effects on a child’s brain. Because of this and other studies, The American Academy of Pediatrics recommends that parents read to their kids as infants, even if it’s just a for few minutes. The positive effects are now well known and are supported not only by teachers and parents, but by science. 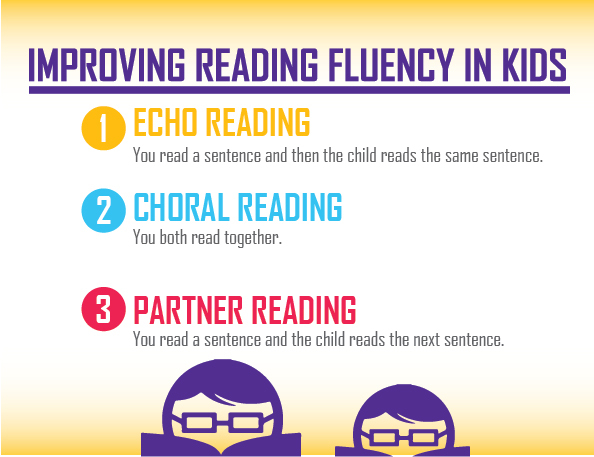 Fluency: What Is It and Why Is It Important for Building Strong Readers? Most early grade teachers are familiar with the fluency basics and why it is important. Inits most basic format fluency is the ability to read with speed, accuracy, and appropriate expression. At each grade level there are certain expectations for a student’s reading fluency. 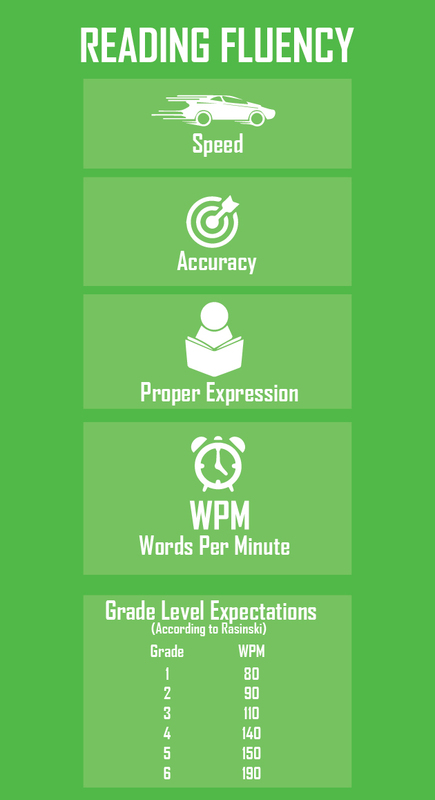 The primary metric used by teachers and research professionals is called words per minute (wpm).Each student is expected to have a satisfactory wpm score to be considered reading on grade level. There are a number of different fluency studies with varying grade levels of wpm scores. For example, the Rasinski scale suggests that a first grader should read 80 wpm by the end of the year. Harris & Sipay recommends between 60-90 wpm and Manzo, 30-54, respectively. The 2006 Hasbrouck & Tindal Oral Reading Fluency study goes a step further and considers several different factors including reading percentile, fall, winter, and spring reading assessments, and weekly improvement. The graph below provides you with ways to measure your child's reading fluency expectation. • Echo Reading– You read a sentence and then the child reads the same sentence. • Choral Reading– You both read together. • Partner Reading– You read a sentence and the child reads the next sentence. That’sit! Don’t forget get to ask lots of questions before and after you read the story. Also, have them make inferences from the images in the story to help with comprehension. We suggest doing using these proven methods for just 15 minutes a day three times a week. There are obvious benefits to using interactive books. Increasing motivation to read, feedback,and the ability to include animation and sounds are just a few. Our Learn to Read: Vowel Stories interactive book app is a great place to start when it comes to learning how to read. It contains colorful characters, animations,sound, and will increases interest in reading. While the benefits of using technology to teach children to learn how to read, we also believe that teachers and parents should also use proven traditional tools alongside technology. We believe that contemporary educators should use multiple tools (visual, audio, kinesthetic) to teach and reinforce basic reading concepts. 1) Use our Vowel Stories worksheets that reinforce long/short vowel sounds and sight words. 2) Use a digital camera take a picture of 10 short/long vowel sounds found in the stories. 3) Use a word processing program (e.g. Word) type ten sight words your child remembered from the story. Print out the assignment, sign it, and post on your refrigerator! 4) Have a verbal spelling contest where you ask your child to spell certain words.Spell ten words correctly and someone gets ice cream! 5) Draw a picture of ten sight words that are nouns (person, place, or thing). In this section we will demonstrate some quick tips for our Learn to Read: Sight Word app, an app with over 500 words including common sight words, beginning consonants,ending consonants, and word families. The purpose of app is to help improve the vocabulary of young readers. • Tip #1 - As with most of our apps we suggest that you work at least 15 minutes, 3 times a week. If the child is unable to for 15 minutes, start with five minutes and work your way up to 15 minutes or more. • Tip #2 - When you first start using the app work together with your child by modeling the behavior. For example, as the word appears you repeat the word. Continue this and then have the child repeat after you if they do not know the word. Modeling behavior helps the child focus on how to use the app. • Tip #3 - To swipe or not to swipe - With this feature you can elect to control the pace of the words. For example, on automatic mode the words will appear every 4 seconds. In manual mode, the child swipes at their own pace. • Tip #4 -Words completed - In this section you can track the words that the child has scene. Learn To Read: Rhyme Stories - Why Should You Read Rhyming Books to Children? • Learningrhymes early increases a child’s chances of becoming a strong confident reader. • While rhymingbuilds phonemic awareness or the ability to distinguish between sounds. • Rhyming helps children recognize word patterns and teaches word families. • Rhyming is fun for children and motivates them to read more. • Rhyming helps children’s spelling ability. Our Learn to Read: Rhyme Stories is designed to help children build early literacy skills by providing rhyming stories and other literacy rich activities. The stories include Joe has a Sore Toe, Pete Has Big Feet, Kim Likes to Swim, Jenny Found a Penny, Mike has a Bike, and Paul is Tall. The Learn to Read: Rhyme Stories series provides parents and educators with an arsenal of literacy weapons to help build phonological awareness. The goal of ultimately making them a stronger more confident reader.